Lenovo, Intel and Microsoft reached a strategic deal in Beijing to join hands in the education information sector to develop cloud-based digital campus solutions. 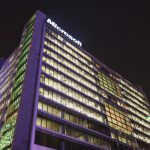 In the cooperation of the three parties, Lenovo will be the end-to-end intelligent education solutions provider, who will deploy Intel's processor and Microsoft's cloud computing platform to its terminal products, including servers, storage products, PCs, and mobile Internet devices, to create a series of education-oriented cloud computing solutions. In addition, the three parties will integrate third-party software developers to jointly hold marketing campaigns, open training sessions for teachers and students, promote education software, and implement pilot projects. At the signing venue, they displayed parts of the education solutions. With these solutions, teachers and students can easily establish websites to realize interactive networking learning. Teachers can coordinate to make lesson plans and manage teaching calendars. Financial terms of the deal were not announced. In Hangzhou where can I get my Lenovo thinkpad repaired quickly and cheap? I called your phone number but it is all Chinese and I need to speak English please!